Rita spent the night and we used a Chebe Cinnamon Roll Mix as crust for the apple torte we baked before going to bed. I think Rita is trying to bring Mom into the current century as far as kitchen gadgets;-) We used her Cuisinart Prep 11 Plus ® Food Processor from Cooking.com to shred the apples for our torte. She remembers shredding cheese with my grandmother’s favorite shredder, a vintage Griscer food grinder replete with hand crank and clamp and I guess she didn’t want to revisit that experience. Of course I still love the Griscer being so ‘hands on’ but I no longer have a table or counter that will accommodate the clamp. We used half a batch of Chebe dough rolled thin and pressed into a 9 inch glass pie plate. We filled it with three prepped, shredded apples mixed with a handful of raisins, 1/2 teaspoon ground cinnamon, and sweetened with 1/3 cup of Lakanto and about 1 tablespoon of agave syrup. It baked at 400*F for about 45 minutes. We did not add a thickener to the fruit and I was afraid the juice would make for a really wet pie. But it came out just right. It wasn’t too sweet and we enjoyed quite a bit of it for breakfast. For next time I would go ahead and remove about half of the apple peelings. We washed them and cut out the core but left the peel. Sometimes less is more. 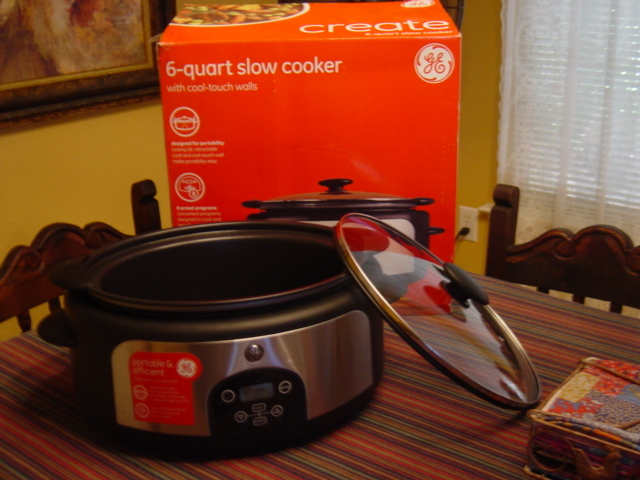 The next morning Rita wanted to introduce me to her slow cooker. I still have the original (of course), 2.5 quart, red Rival Crock-Pot® with the funky feet and no-way does the ceramic part remove for washing. And it still works great! You might possibly find one like it on eBay. Some have said the low setting is too low and isn’t safe for cooking. They may have a different brand because this one cooks like a champ. Beans are sooo good cooked all day on low heat. Anyway, her cooker is a GE digital, programmable, cool touch, 6-quart model available on Amazon. It has a retractable cord, a glass lid with a soft seal edge and a steam vent and the entire appliance is not that heavy whereas the 6-quart stone-crock that we own I can barely manage to clean never mind pick it up fully loaded. The weight factor is a BIG plus with me. This one cleaned up very quickly in the sink with no strain at all. I prefer not to put extra-large items in the dishwasher. Rita and I feel very strongly that there was a focus group consisting of knowledgeable cooks that put together the requirements for this design. We can’t think of another feature that would make it better and believe that it is definitely worth the price. Together she and I put together a full cooker of spicy meatballs and tomato sauce – all gluten-free of course. The binder was a challenge because the two of us had wiped out most of a loaf of Udi’s Gluten Free Whole Grain Bread. The few remaining slices plus a couple of my homemade flax meal biscuits plus a teaspoon of ground chia seed soaked in milk became the binder. This bread-binder approach makes a lighter textured meatball than using eggs to hold it together. We pounded fresh garlic in my mortar and pestle (there I go with that ‘hands on’ stuff again), added sea salt and plenty of green herbs (basil, oregano, sage), then mixed it in with the bread paste, and added it all to the ground meat. Rita used a large scoop to form the meatballs and put them into two baking dishes to pre-cook in the oven. I did clean-up while she blended our two jars of Classico Tomato and Basil Sauce with additional herb seasonings in the cooker. After adding the meatballs to the sauce the slow cooker was programmed to cook on low for three hours and then we adjourned to the living room to read the paper and relax. She and I had Tinkyada Fettuccini for our pasta while Don had his usual gluten brand. I don’t eat a lot of pasta even now that it is available to me. I used pasta sauce over vegetables for so many years that I am accustomed to having it that way. Rita and I had a weekend full of tasty, traditional food and all of it gluten-free! Plus I had fun spending time with my daughter and playing with more up-to-date kitchen gadgets. Don enjoyed our food and the break that he had from cooking. Plus we have two more days of dinner to enjoy and Rita took some with her. Disclaimer: No one pays us to talk about their products or sends us anything free. We are trying to stay healthy and hope to encourage anyone else who is on this gluten-free journey.